ProForm Thinline Desk treadmill is one of the most exciting models of ProForm treadmills. Unfortunately, this model is currently out of stock and the manufacturer itself is not sure when they can come with the stocks. However, if this model returns to the market, I have settled on making a review on it for your benefit. This treadmill is high-priced at its original offer of $2,299 and went down to $1,299 at the most recent offer before it became out of stock. Are you a busy person who always needs to be available online? Then, this treadmill is definitely for you. You can do your workout while attending to whatever business you have online by using your console as a desk top. The accessibility to your tablet can let you screen and control wirelessly your incline, decline and speed. You can even customize your workout with the available built-in apps. This is very convenient for you even how busy you are. 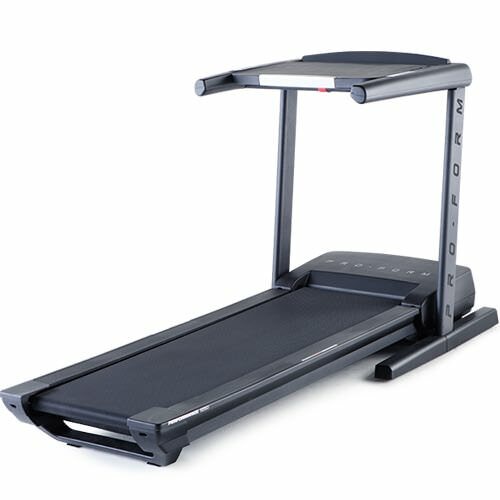 If you do not have ample space at home, this treadmill may also be perfect one for you as when folded, it is so slim at 12 inches the thinnest. But, if you are working on low budget; you might want to check out other models as this one is quite pricey. Take a look at my other reviews with similar features which are priced much lower. ProForm also has models that have great features at more reasonable prices. ProForm Thinline Desk treadmill is an exciting machine wherein you can adjust the console to be a desktop by simply lowering the console and using the flat space as your desktop. Then you can leave the console facing towards you and you can continue with your usual treadmill experience. You only need to slide your tablet into the slot at the console and you are ready to go. The treadmill will sync with your tablet in order for you to wirelessly control your speed, decline and incline. Since this exercise machine is iFit enabled, you can effortlessly customize your training with the various professionally designed workouts and even choose which route to capture with the use of Google Maps. As the name connotes, this treadmill is super thin when folded at 12 inches width. When folded, you can have ample space available at your home. Storing it is effortless and getting it ready for a workout is even easier. To support your various workouts, this treadmill is powered by a 2.75 CHP Commercial Plus Mach Z motor. You are ensured to have smooth and cool workouts with this powerful motor. A plus factor is that the motor has a lifetime warranty. One major weakness of this treadmill is its price which is considered by most people pricey even with the many wonderful features it offers. Another is the track rollers which are a bit smaller than the average rollers used in other treadmills. To a few, they find the cushioning not sufficient for running, only good for walking. The super thin feature for saving space of this treadmill is a very useful coupled with its ability to transform into a desk top. The no assembly feature is well-liked since upon arrival, you can just unpack and go straight with your workout. The safety feature of being activated only by a key is also a very good feature of this treadmill. Most of the users before it became out of stock were satisfied with this treadmill so far. ProForm Thinline Desk treadmill seemingly is an ideal treadmill for active people who need to be always online and are not able to do workouts outdoors or at the gym. Customarily, it is best to buy directly from the makers of this product or its authorized dealers. However, since it is currently out of stock; you can check out online sellers such as Amazon from time to time for the availability of stocks.